The World Cup match between Morocco and Iran will start in less than 24 hours. UPVOTE the comment “MAR - Morocco win”. 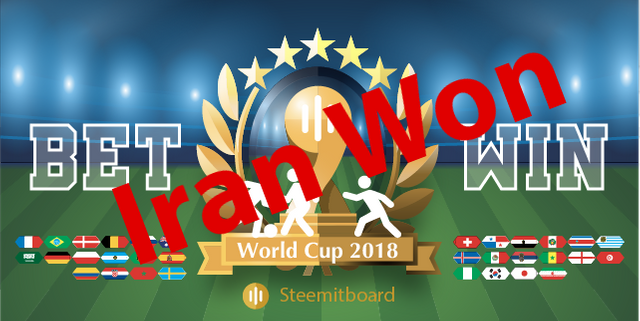 UPVOTE the comment “IRN - Iran win”. Your upvote must be done BEFORE 2018-06-15 15:00:00 UTC to be valid! UPVOTE this comment to cast your bet. DO NOT REPLY TO THIS COMMENT - YOUR BET WILL NOT BE VALID! hi @steemitboard, does the prize win 1700 SBD, for one match or the whole match? Read the annoucement post where prize distribution is explained.